L & JG Stickley Morris Chair, catalog #471, branded signature. 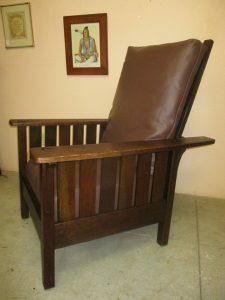 This chair has an original finish, five slats under the arms and a beveled front seat rail. The pivot pegs in the back have been replaced. New seat cushions are covered in brown leather.